GIGABYTE TECHNOLOGY Co. Ltd., a leading manufacturer of motherboards and graphics cards is proud to present a series of new liquid cooling solutions made by EK Water Blocks. 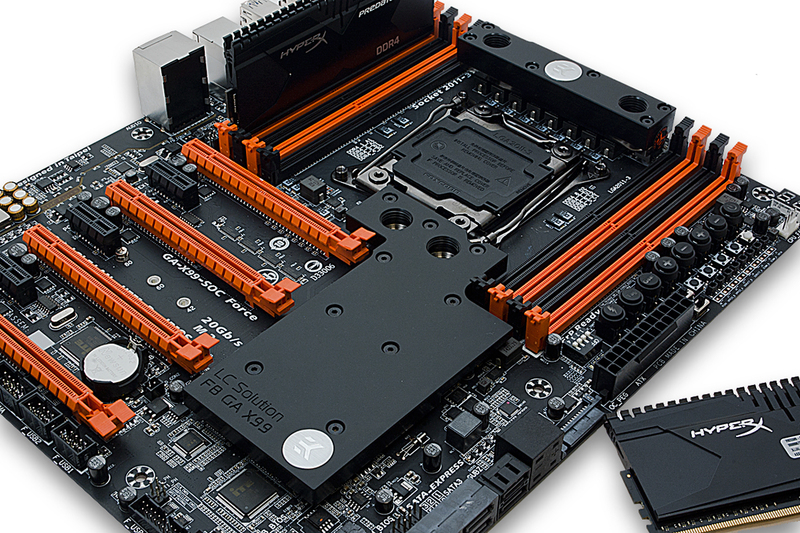 The Slovenia based liquid cooler manufacturer announced earlier this month a new series of motherboard water cooling solutions especially designed for the GIGABYTE X99 series Intel® Core® i7 LGA-2011-3 socket motherboards. The EK-FB KIT GA X99 is a complete water cooling solution, made with a base of nickel-plated electrolytic copper while the top is made of quality POM Acetal or acrylic glass material (depending on the variant). Tailor designed for GIGABYTE X99 series motherboards, the coolers consist of two separate water blocks; one water block directly cools the Intel X99 chip while the other takes care of the power regulation area. Not only do the water blocks look amazing and are quieter than an air cooling system, they are actually as efficient as the GIGABYTE factory cooling solution. The screw-in standoffs are already pre-installed and allow for easy and trouble-free installation by utilizing original motherboard back plates.